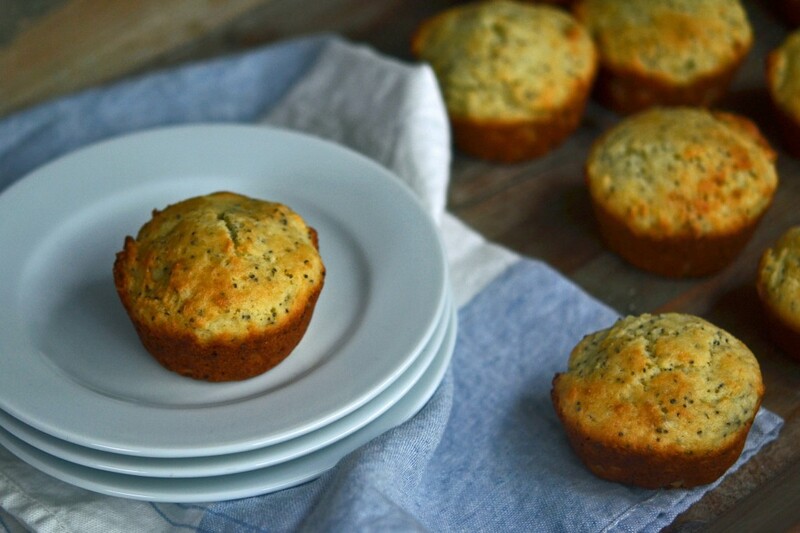 Lemon Poppyseed Muffins | Great gluten free recipes for every occasion. My husband and I have been married for, like, a million years. I cook nearly everything he eats. He doesn’t even open the refrigerator most days, ’cause he eats what I give him and isn’t home enough during the week to wonder about anything else. I know he doesn’t care for cucumbers or watermelon (who doesn’t like watermelon? *he doesn’t*). He has preternatural affection for zucchini. In the summer, he has a long history of growing it all over the place & imposes it on me every single day for months. How much can you really do with zucchini in overabundance? I did not know that Lemon Poppyseed Muffins were his favorite. Since he’s a man of few words, I have to read his body language like tea leaves. When he really likes something, he stares at the food in between bites. So I did not know about his love of lemon poppyseed muffins. 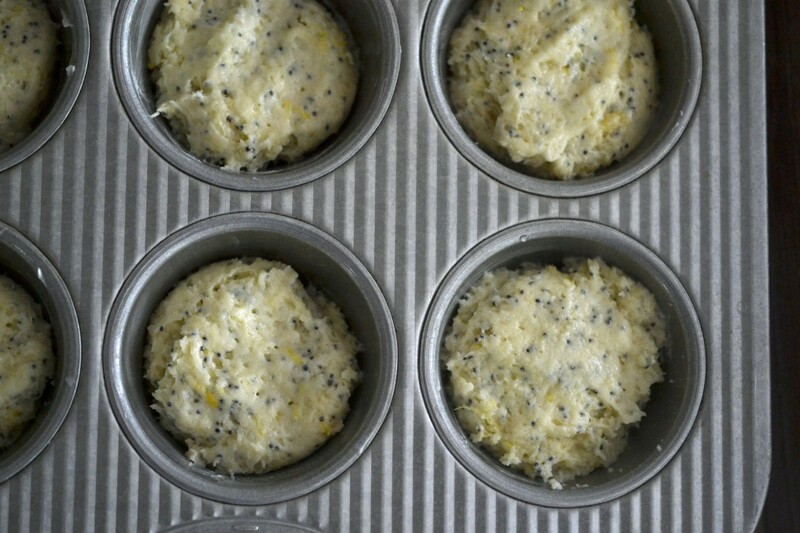 Until I made him—lemon poppyseed muffins. These muffins are lightly sweet, lemony masterpieces. They’re a little crusty on the outside, and soft & moist inside. And they just say ‘spring’ to me, even though I’m not sure why. It’s not like I have a lemon tree in my backyard or anything. Oh how I wish I had a lemon tree in the backyard. I’d make lemon poppyseed muffins and Lemon Bars all the livelong day. Try making this recipe. You never know. Someone you love might secretly be hoping against hope that you’re going to whip up a batch. 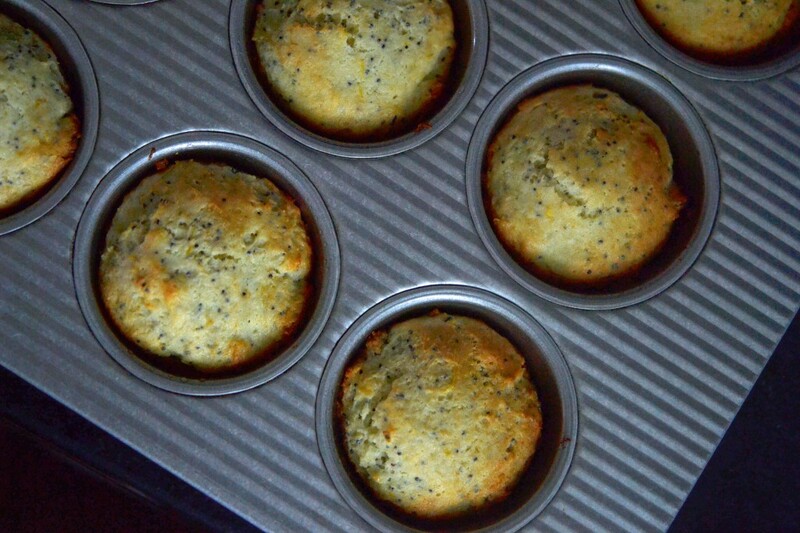 Grease a standard 12-cup muffin tin and set it aside. Preheat your oven to 350 degrees F.
In a medium sized bowl, place the flour, xanthan gum, baking powder, baking soda, salt, sugar, lemon zest and poppy seeds, and mix to combine. Add the butter, sour cream, lemon juice and eggs, beating well to combine after each addition. Fill the 12 cups of the muffin tin about 3/4 of the way full. Smooth the tops of the batter with wet fingers. Place the muffin tin in the center of the preheated oven, and bake for 22 to 24 minutes, or until a toothpick inserted into the center of a muffin comes out clean. P.S. If you like the blog, why not pick up a copy of My Cookbook? Your support really means so much to me. In fact, I simply couldn’t do this without you. I assume these muffins can be baked ahead of time and frozen? Have you ever tried this? I haven’t ever tried freezing them, but I’m sure you could do that. Before freezing them, just be sure to put them in something freezer-safe, and remove as much air as possible from the container. Made these this week-end. I did dip the tops in a melted butter/lemon combo & then a touch of sugar after baking. To die for! If my gluten eating family rants & raves, it is in my cooking repertoire & they did. Sounds great, Patti. Love a new addition to the repertoire! Yum, oh yum, oh yum! Everyone loves these! I plan to take some for my friend’s husband who must eat GF when I visit this week. (I subbed Splenda for the sugar since I’m trying to cut carbs. Exceptional. Thank you! Generally muffin recipes can be doubled without a problem, but I have never tripled this. In much larger quantities, recipes sometimes break down. If it’s not too much trouble, I would suggest making one double recipe, and one single, to be on the safe side. Enjoy the breakfast! Yes, Brian is my husband. :) We won’t be in Northern California at all, but thank you. I’m glad you’re enjoying the blog! My husband trained as a chef so I get, “This is good, but do you know what you could do?” Funny thing is I’m lucky if I can get him to even help with dinner once a month! And he doesn’t even work in the food industry anymore, so it’s not like he’s burned out after a long day in a kitchen. Sigh…. I guess I’ll keep him though. Anyway, these muffins look great and the heck with hubby, these are MY favorite so I can’t wait to try them. I do gluten full baking for my husband’s customers and for others as well and try to use glass or solid surfaces, etc because I have heard that the non-stick can retain the gluten. I am still feeling my way through this whole experience being fairly new to team gluten free. Yum, yum, yum! My favorite muffins! My dear strong-silent-type husband can’t tolerate seeds so for him I add freeze dried strawberries! He calls them Strawberry-Lemonade muffins. Oh, you are so good to him, Rebecca! Since he’s the strong silent type, too, I guess you’re lucky to know that he likes strawberry-lemonade muffins! They sound great. 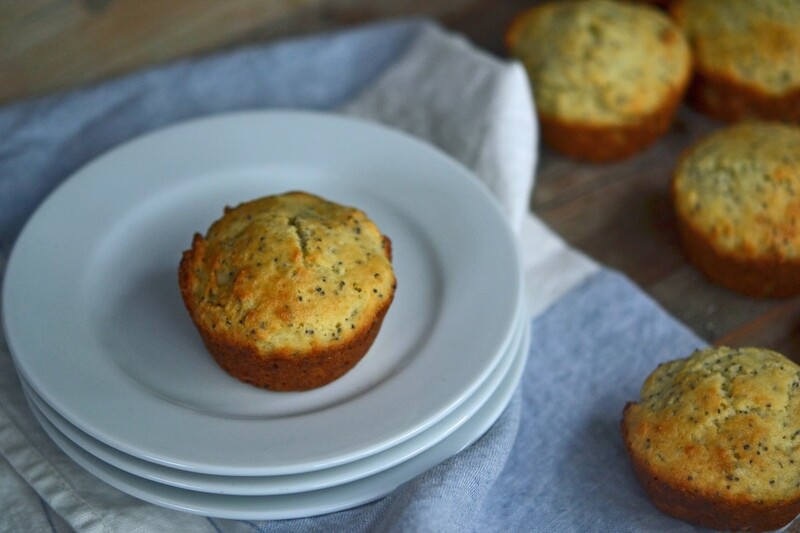 I lurrrve lemon poppy seed muffins…now just to figure out how to fit baking them into my schedule. As always, Nicole, you rock! I started making these and then found out we didn’t have poppyseeds. So, I threw in some frozen blueberries…to die for! The batter alone was so awesome! Since we bought the poppyseeds, my hubby has been requesting that I make these. They should be ready in a few minutes. Thank you very much! Now I just need to find the time to post it. Do you mind if I post my version of this recipe(GF and vegan) on my blog and include a link back to your recipe? Thank you by the way, these muffins are amazing! I decided I only wanted to make one batch (instead of one with eggs and dairy and one without), so I set straight out to make them vegan and both of my girls loved them, even the egg and dairy eater. I do usually blend my own flours, and they vary depending on what I’m making, but as soon as I have a little extra cash I am definitely going to order some Better Batter and give it a try. I am so glad that you liked this recipe. If you indicate clearly, at the top of the recipe (rather than just a link afterward), that it is adapted from Gluten-Free on a Shoestring, it is fine to include the recipe on your blog. I hope you enjoy Better Batter! I can’t believe I hadn’t heard of you before this. Your blog is fabulous, and I love your writing style! I just stumbled upon you because my teenage daughter, newly GF and still eating eggs and milk, is craving lemon poppyseed muffins. Of course if these are good, and I have a feeling they will be, this also means I will have to make a second batch for my little one without the eggs and milk . Anyway, I have a question. I have never heard of Better Batter but it sounds like you may use it yourself, can you tell me what is in it? I don’t generally use all purpose GF flour blends because they tend to have too much rice flour for my taste. Oh I just can’t tell you how excited I am to try these, and your pita bread…oh my gosh! Oh yes, one last thing, my mother doesn’t like watermelon either. We always thought she was the only one in the world. I guess there are two. Better Batter is the all-purpose gluten-free flour that I use and recommend. If you click on the “Order Now” button on their logo in the sidebar, it will take you right to their site. It is a rice-based all purpose GF flour, but it doesn’t taste at all ‘grainy,’ if that is what your concern is with rice-based flours. I have met people at book-signings who have said that they do not like rice flours, and then they try something made with Better Batter and love it. Up to you, though. The only type of ‘all-purpose’ GF flour that I recommend AGAINST, since I do not believe it is at all truly all-purpose, is the bean based flours, like Bob’s Red Mill. They smell bad, have a terrible aftertaste, and do not behave the same as true all purpose GF flours. I hope that’s helpful — and welcome to the blog! I think we’ll get along quite well. After all, between the two of us, we know the only 2 people who don’t like watermelon! Lemon is my favorite flavor and I do love muffins. Can’t wait to make these! I made these today using the potato starch sub you suggested. They are still a bit moist inside but DELICIOUS!! A definite winner recipe that will be a regular around here! Thanks!! That’s great that the substitution worked so well! Thank you so much for letting us know. Another awesome recipe! We loved the muffins . . .and my husband isn’t crazy about anything lemony and he LOVED them! Thanks for continuing to make us gluten free eaters so happy!! Thank you for posting, & for coming back again and again. It means so much to me. Love the recipe, love the blog design, but I think the font is hard to read. Maybe its just me. Keep up the great work! My literary agent had the same comment! I will ask the blog designer to experiment a bit. Maybe a “sans serif” font. This is probably an old question, but if I have gluten-free all-purpose flour that has guar gum in it should I still add the xanthan gum (which I don’t have yet)? My very limited understanding is that they have the same purpose. This is day 7 gluten-free for me and I have a lot to learn! I did just order your book though! It’s certainly a new question for you, Kate! I’m impressed that, 7 days in, you’re asking such an articulate question! The answer is that, no, if your all-purpose GF flour already has guar gum in it, you do not need to add xanthan gum. They do serve the same function. They are generally used in varying degrees, but I’m sure your all-purpose GF flour has taken care of all of that. That’s what makes it “all-purpose” (and why I love an all-purpose GF flour). Just grab it and go! You may be right that you have a lot to learn, but you have obviously already learned a lot! Go Kate! Thank you for ordering my cookbook. I really appreciate it, especially so early in your process. Post back with any other questions, and check us out on facebook.com/gfshoestring! Thanks for replying! I have immersed myself in gluten-freeness over the past week and learned a LOT, but I’m a little overwhelmed and suffered severe sticker shock on my first trip to the local grocery store! My following trip to Trader Joe’s was a little better, but I rushed right home and researched how to do this *without* going broke (and without needing ten different flours and weird ingredients) and found you. :) I love to bake so I’m very excited to try out your recipes with this fabulous invention of all-purpose gluten-free flour. Who knew?? It’s only been a week but I feel so much better off the gluten and now I’m starting to think this might not be the worst thing in the world. I’m a little scared to eat out, but I guess I’ll figure out as time goes by what works and what doesn’t. By the way, poppyseed cake was my FAVORITE growing up. Love the post! I’m really, really pleased with and impressed by your ingenuity in realizing so early on that it didn’t have to be so difficult – or so expensive – to eat well while eating gluten-free. It took me a lot longer than a week to realize that, way back when! I think the ten-different-flours-and-weird-ingredients brigade is going to peter out, but for some reason it’s taking a while. Conventional home cooks use an all-purpose gluten-free flour, and with products like Better Batter out there, so can we. You are well on your way to being proficient, and you’ll be converting your own old recipes in no time. As far as eating out, it can be scary, but you might have some luck finding restaurants that participate in the Gluten-free Restaurant Awareness Program (GFRAP), which educates mainstream restaurants on how to prepare and provide contamination-free gluten-free food. http://www.glutenfreerestaurants.org/ It’s run by GIG (the Gluten Intolerance Group), and was started by a member of the Board of Directors of my local celiac support group. It’s a wonderful resource. Best of luck – and go make some poppyseed cake! These are in the oven right now, can’t wait to taste them they smell so lemony and yummy!! Thanks for all your help Nicole. My husband is similar, doesn’t say much, eats what I make. Every once in awhile he’ll compliment something so then I know it must be good! It’s my pleasure, Kristi. When something is in the oven that smells good, especially something lemony, my children & husband start to swarm around the kitchen. It’s like an infestation! It sounds like your husband is similar to Brian. Instead of everything being super-sized, everything is minimized! Enjoy the fresh muffins. You can do anything! These look great! Any suggestions on replacing the eggs though? My husband (funny enough, also a man of few words) can’t tolerate eggs, corn or gluten. Eggs in gluten-free baking are stabilizers and help with rising, and replace for gluten as protein. These substitutes are imperfect, but each should work. Let us know how it goes! There are definitely other reader who will benefit from your experimentation. Thank you for posting! love your description of how you tell if your husband really likes the food. Mine has a very limited vocabulary for food (despite being a writer) and I struggle to get him away from ‘fine’..
Brian is a writer, too! I’m always having to remind him that he expresses himself in words for a living, but still everything is good. I have to listen carefully to inflection and read body language, like a detective. I still wonder if one day he might surprise me with something more descriptive. Hope springs eternal! My milk-free version turned out well! I used almond milk with lemon juice instead of sour cream, and shortening instead of the butter. I’ll be posting a photo if I can figure out how… Thanks for a great recipe, and help with the milk-free alternative! Wow! You weren’t kidding about hopping right to it! I’d love to see a photo! You’re very welcome, and thank you for posting and sharing your success with substitutions! That is always such useful information! What luck! It turns out I have all of these ingredients on hand, even the poppy-seeds (as I recently made your Everything Bagels), and I had been meaning to attempt lemon poppyseed muffins someday. Someday shall be Sunday. 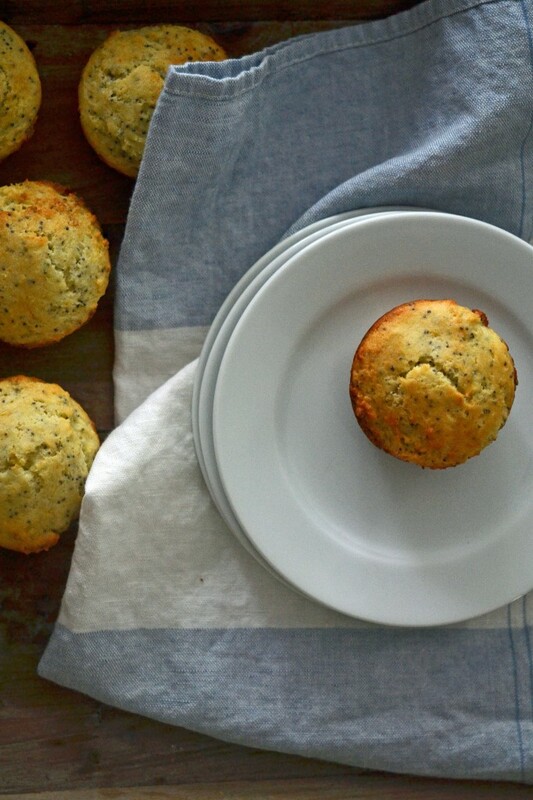 Enjoy the lemon poppyseed muffins on Sunday! Thanks so much for posting.